To Cite: Shahriari-Namadi M, Tabatabaei H R, Soltani A. Entomophobia and Arachnophobia Among School-Age Children: A Psychological Approach, Shiraz E-Med J. 2018 ; 19(7):e64824. doi: 10.5812/semj.64824. Background: Entomophobia/arachnophobia is an irrational fear of insects and ticks and is considered among the most serious psychological problems, demanding professional treatments. Objectives: The present study aimed at identifying the prevalence of entomophobia and arachnophobia as well as recognizing the factors affecting it among elementary and high school students of Shiraz, southwest Iran. Methods: A total of 531 questionnaires were distributed randomly among female and male students in elementary and secondary schools, studying in four school districts of Shiraz. Results: Overall, 260 interviewed students (49%) were female and 271 (51%) were male. Furthermore, 35.8% of all subjects were afraid of insects and spiders and 52.45% of the individuals had a feeling of disgust about them. The results showed that 24 students (4.5%) had severe phobia, 177 (33.3%) medium phobia, and 330 (62.1%) mild phobia to insects and arachnids. This kind of phobias showed a direct relationship with factors such as gender, number of children in the family, and mother’s job. 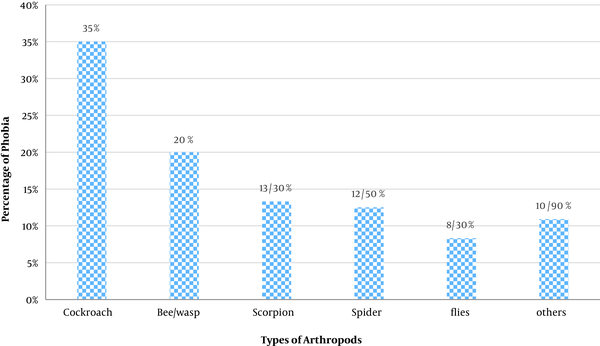 Phobias of cockroaches and bee/wasp were higher than that of other arthropods. Conclusions: According to the results of this study, having enough knowledge about insects can significantly reduce irrational fear and phobia in students. Moreover, exposure to some insects can also be very helpful in dealing with this issue. A phobia is an excessive and irrational fear reaction and a kind of anxiety disorder, in which the individual has a relentless dread of a situation, living creature, place, or thing. Such fear is highly disproportionate to the reality of the risk (1). Although most of the causes and treatment methods of this fear are well-known, there are some limitations regarding its cure. The impact of a phobia can range from annoying to severely disabling. People with phobias often realize their fear is irrational, yet they are unable to do anything about it. For some people, even thinking about their phobia is immensely distressing (2). People with phobia cause discomfort to others, and their behavior is socially unacceptable. Although individuals with phobia are aware that their fear is irrational, they cannot control their feelings. Therefore, a phobia is unquestionably a social dilemma (3). According to some statistics, 6.2% of the population has several phobic symptoms, and about 1% of the population has a severe phobia, which in some cases leads to disablement (4). The most common types of phobias are specific and social types. Specific phobia is divided to four categories, one of the main parts of which is the fear of particular animals. Animal phobia generally begins during childhood, intensifies in adulthood, and rarely begins after maturity. An animal phobia is highly concentrated and can continue for decades without recovery if left untreated. About 5% of all paralyzing phobias and 15% of lighter phobias are related to certain animals. Moreover, 95% of animal phobia cases are seen in females, who are psychologically relatively healthy and phobia is their only psychological problem. Arthropods, as the largest phylum in the animal kingdom, include species such as lobsters, crabs, spiders, mites, insects, centipedes, and millipedes. About 84% of all known species of animals are members of this phylum (5, 6). Insects, as the largest class (Insecta) of hexapod invertebrates within the arthropod phylum, can lead to insect phobias in humans, either directly or indirectly by stimulating mental states. Delusional parasitosis (Ekbom’s syndrome) is another problem with insect phobias that can affect the health of vertebrates. Entomophobia/arachnophobia is an irrational fear of insects and ticks and is considered among the most serious psychological problems demanding professional treatments. In most cases, an animal phobia is caused by a possible insect reaction, such as jumping on a person (7). Studies show that the prevalence of specific fears in children and adolescents is higher compared to adults. However, researchers have shown that the typical age of the disease for specific phobias is between 10 and 13 years (8). The initial age for animal phobia is usually 12 years old. One of the largest epidemiological studies in this field (n = 43093) on specific fears was done in the United States and found that the highest prevalence of phobia was in children and adolescents. The results of the research on the effects of gender in children with specific fears showed a significant difference in children younger than 10 years of age, and in females, it was six times higher than that of males (9-11). A study in Germany showed that females are more likely to experience phobic disorder than males. Also, it was found that this gender difference may be due to methodological differences or based on the reflection of different referral rates for treatment in males and females. In this study, the prevalence of animal fear was three times higher in females compared to males. The teenage period is a period of life, during which the development of female’s phobia and fears form and develop faster than males (12). Insect phobia is most likely caused by two main causes: 1, True entomophobia; this phenomenon occurs when a phobia is raised in a person with a certain idea and gradually develops. 2, False entomophobia; when a person is exposed to insects suddenly (13). The evolutionary study of fear of insects (generally phobias) and the genetic basis of fear emphasizes the importance of the right behaviors of parents, especially mothers, which may lead to a fear in children ( 12, 14). People with entomophobia experience anxiety even if they realize that many insects do not have any threats to them. Patients complain of external contamination with these external parasites and self-illness develops and becomes a mental and nervous disorder (15). According to studies, the prevalence of anxiety disorders is 31.2% over a lifetime and 12.5% of these disorders are the cause of fear. In general, phobia has been reported in females more than males (16). Phobia is reported in relation to various arthropods, such as spiders, butterflies, ticks, bees, and wasps. It is known that animal phobia often forms and develops during childhood regarding the inappropriate assessment of a hazard (13). In 82.3% of the students, the problem is when they are exposed to flying insects and their great challenge is understanding real dangerous insects and protection against them (17). Genetic and environmental factors can cause phobias. Children, who have a close relative with an anxiety disorder are at risk of developing a phobia. Exposure to confined spaces, extreme heights, and animal or insect bites can all be sources of phobias. Therefore, understanding epidemiological factors affecting animal (especially arthropods) phobias could be very critical. To the best of the authors’ knowledge, no comprehensive studies have been done so far on this matter in the southern part of the country. Hence, the present study aimed at identifying the prevalence of entomophobia and arachnophobia as well as recognizing factors affecting it among elementary and high school students in Shiraz, southwest Iran. Cluster random sampling was performed in this study. A total of 531 questionnaires were distributed randomly among females and males in elementary and secondary schools (including both state and private schools), studying in four school districts of Shiraz. After gathering the completed questionnaires, all data were imported to the Excel software in order to draw the graphs. Also, using the SPSS software version 19, the data were analyzed by chi-square, T-test in two separate samples, and finally, regression analysis. The first part of the questionnaire (demographic questions) included variables such as the type of school, age, gender, father’s occupation, mother’s occupation, number of children, and family rating. In this part, a code was assigned for each variable. In the second part of the questionnaire, 20 specific questions were included in the text of the questionnaire. Questions 1, 2, 3, 4, 14, 15, 16, 17, 18, 19, and 20 were related to fears and questions 5, 6, 7, 8, 9, 11, 12, and 13 were related to phobias, and the question 10 was about the disgusting feeling of students about arthropods. Grading test for each question was rated from 1 to 5 (‘totally agree’: 1, ‘agree’: 2, ‘no idea’: 3, ‘disagree’: 4, and ‘totally disagree’: 5). To calculate phobia level, scores 8 to 12, 13 to 24, and 25 to 40 were related to mild, medium, and severe phobias, respectively. The sample consisted of 531 students, of which 260 students (49%) were female and 271 (51%) were male; 35.8% of all subjects were afraid of insects and 43.7% had a history of insect bites. Furthermore, 54.65% of students were afraid of the high density of arthropods and they would escape if they saw them; 52.45% of the individuals had a feeling of disgust about insects and spiders; 40.3% of participants checked the area for insects and other little creatures before entrance; and 16.95% of all participants believed that fear of insects was one of their worst fears. Results of the current study showed that 31.6% of cases were eager to maintain insects and spiders as a pet or for economic purposes in their houses and were less afraid of insects compared to the rest of the population. Also, 17.35% of school children were insensitive to insects and arachnids because of their living environment, where they had been already exposed to them and thus were less afraid of them. The prevalence rates of entomophobia and arachnophobia among elementary and high school students based on their gender are shown in Figure 1. The results showed that 24 students (4.52%) had a severe phobia, 177 (33.33%) medium phobia, and 330 (62.15%) mild phobia to insects and arachnids. Based on the Chi-square test results, there was no significant relationship between father’s job and the occurrence of phobias among their children (P value = 0.496). There was also no relationship between the mother’s job and birth order with phobias. Nevertheless, there was a direct and meaningful relationship between gender and phobias (P value < 0.000). Out of all students, who had severe entomophobia and arachnophobia, 83.3% were female and 16.7% were male. In mild to moderate phobia, the percentage of female students was higher than that of males. There was no meaningful relationship between the occurrence of entomophobia and school type (the education level of students and also the kind of schools). Based on the results of Mann-Whitney test, there was no significant difference between the two types of schools (state and private) in terms of fear score, phobia, disgusting, and total score. However, the two genders were completely different in terms of fear scores, phobia, disgusting, and the total score (P value < 0.000). Based on the Spearman statistical analysis, the number of children showed a significant inverse linear correlation with disgust (r = -0.106, P value = 0.015), phobia (r = -0.105, P value = 0.016), and the total score (r = -0.112, P value = 0.01). Mother’s job had a significant relationship with a phobia (P value = 0.033), while the father’s job was not related to fear, phobia, disgusting feeling, and total score. Individuals previously having a history of insect bites had a significant and meaningful linear relationship with fear and disgust. Among all students, the most common entomophobia and arachnophobia were recorded for cockroaches (35%), bee/wasp (20%), scorpion (13.30%), spider (12.50%), and flies (8.30%) in the order of their appearance (Figure 2). The findings of this study showed that entomophobia and arachnophobia are common in more than half of students in different educational levels. This kind of phobias showed a direct relationship with factors such as gender, number of children in the family, and mother’s job. The results indicated that entomophobia and arachnophobia among female students are more intense than that among male students, probably due to cultural and psychological factors, such as the level of self-confidence and limitations of females in the society, and a false cultural and family belief regarding the inability of females in doing some specific tasks. Also, regarding the number of children, a family with a higher number of children showed less fear and phobia, probably because such families members support each other better, make each other feel more powerful, and transfer their experiences. In relation to the mother’s job status, the children of illiterate and householder’s mothers had more phobias than employed and educated mothers, probably because of the high dependence of the children of the housewives to their parents in relation to the children of employed mothers. Consistent with other previous studies, the current results showed that individuals with a history of insect and spider bites had higher levels of phobia since it reminds them the pain of insect bites and its possible complications. Firoozfar et al. (2012) studied the knowledge, attitudes, and practices of entomophobia and concluded that there was no significant difference between age and insect phobias. More than 71% of the studied cases believed in the relationship between gender and entomophobia. They also stated that there was a relationship between insect phobia and types of human habitat. Most of the participants believed that there was a correlation between entomophobia and insect densities. Most of them considered insect phobias caused by biting insects. In this regard, 37% of the subjects offered killing insects and 22.5% preferred to escape as the first response when facing insects (13). The results of the present work are similar to those from the literature. Although a significant difference was not found between age and phobia, this research found a meaningful relationship between gender and phobia, which had a higher prevalence among females compared to males. The current results also indicated that there was a correlation between the habitat of individuals, the density of insects, and the history of biting with the occurrence of phobias. Also, Hayati and Minaei (2015) studied entomophobia among university students at Shiraz University and reported that insect phobias can be reduced by exposure to these creatures. Among the four groups of insects studied in this work (i.e., dragonflies, cockroaches, bees, and butterflies), cockroaches and butterflies triggered the highest and lowest rates of phobia among all participants (17). In this connection, the current study showed that people, who had the experience of being in insect-rich environments showed less phobia than others did, and phobias of cockroaches and bee/wasp were higher than that of other insects and arachnids. According to the results of this study, having enough knowledge about insects’ biology and ecology can significantly reduce irrational fear and phobia in students. Therefore, it is recommended to hold some workshops on insects’ biology and ecology for students, especially elementary students in order to understand the importance of arthropods in nature and recognize real dangerous arthropods from other beneficial ones. Moreover, exposure to some insects can also be very helpful in dealing with this issue. By implementing these methods, an effective prevention will occur for probable phobias associated with arthropods in the future. The authors are grateful for the assistance (Grant No: 95-01-04-13808) of the vice-chancellorship for research and technology at Shiraz University of Medical Sciences (SUMS). Disclosure Statement: No conflict or competing financial interests existed. 1. Ollendick TH, King NJ, Muris P. Fears and phobias in children: Phenomenology, epidemiology, and aetiology. Child Adolesc Ment Health. 2002;7(3):98-106. doi: 10.1111/1475-3588.00019. 2. Davidson J. Contesting stigma and contested emotions: personal experience and public perception of specific phobias. Soc Sci Med. 2005;61(10):2155-64. doi: 10.1016/j.socscimed.2005.04.030. [PubMed: 15955606]. 3. Stravynski A. Fearing others: The nature and treatment of social phobia. Cambridge University Press; 2007. doi: 10.1017/cbo9780511618727. 4. Seligman MEP, Rosenhan DL, Walker EF. Abnormal Psychology. Norton; 2001. 5. Gerdes ABM, Uhl G, Alpers GW. Spiders are special: fear and disgust evoked by pictures of arthropods. Evol Hum Behav. 2009;30(1):66-73. doi: 10.1016/j.evolhumbehav.2008.08.005. 6. Scandola M, Bastinelli A, Spoto A, Vidotto G. The Fear of cockroaches questionnaire (FCQ). Rev Psychol. 2010;17:111-8. 7. Brown JS, Abrahams S, Helbert M. An unusual case of a wasp phobic. J Behav Ther Exp Psychiatry. 2003;34(3-4):219-24. doi: 10.1016/j.jbtep.2001.09.001. [PubMed: 14972669]. 8. Strauss CC, Last CG. Social and simple phobias in children. J Anxiety Disord. 1993;7(2):141-52. doi: 10.1016/0887-6185(93)90012-a. 9. Becker ES, Rinck M, Turke V, Kause P, Goodwin R, Neumer S, et al. Epidemiology of specific phobia subtypes: findings from the Dresden Mental Health Study. Eur Psychiatry. 2007;22(2):69-74. doi: 10.1016/j.eurpsy.2006.09.006. [PubMed: 17157482]. 10. Bouchard S, Wiederhold BK, Bossé J. Arachnophobia and Fear of Other Insects: Efficacy and Lessons Learned from Treatment Process. 2014. p. 91-117. 11. Craske MG. Origins of phobias and anxiety disorders: Why more women than men?. Elsevier; 2003. 12. Ozkan AT, Mumcuoglu KY. [Entomophobia and delusional parasitosis]. Turkiye Parazitol Derg. 2008;32(4):366-70. [PubMed: 19156613]. 13. Firoozfar F, norjah N, Baniardalani M, Moosa-Kazemi SH. Knowledge, attitudes and practices study in relation to entomophobia and its application in vector-borne-diseases. Asian Pac J Trop Biomed. 2012;2(2):1135-7. doi: 10.1016/s2221-1691(12)60373-6. 14. Gerull FC, Rapee RM. Mother knows best: effects of maternal modelling on the acquisition of fear and avoidance behaviour in toddlers. Behav Res Ther. 2002;40(3):279-87. doi: 10.1016/S0005-7967(01)00013-4. [PubMed: 11863238]. 15. Wittchen HU, Stein MB, Kessler RC. Social fears and social phobia in a community sample of adolescents and young adults: prevalence, risk factors and co-morbidity. Psychol Med. 1999;29(2):309-23. doi: 10.1017/S0033291798008174. [PubMed: 10218923]. 16. Munstedt K, Muhlhans AK. Fears, phobias and disgust related to bees and other arthropods. Adv Stud Med Sci. 2013;1:125-42. doi: 10.12988/asms.2013.13011. 17. Hayati D, Minaei K. Investigation of entomophobia among agricultural students: the case of Shiraz University, Iran. J Entomol Acarol Res. 2015;47(2):43-5. doi: 10.4081/jear.2015.4817.